I used Manila clams for this vongole but I find that clams in Japan are much more meaty and flavorful. Nevertheless this vongole turned out good. I would never use Quahog clams or any of those other thick shelled clams though. 1. Boil the water for the pasta. Keep adding salt until it tastes salty. 2. Smash and peel a garlic and heat slowly in extra virgin oil with a dry chili. 3. When the garlic has browned slightly, add the clams and white wine. Allow the white wine to evaporate and place a lid to steam the clams. 4. Start cooking the pasta. 5. When the clams have opened up, remove them from the pan. Keep reducing the clam drippings. 6. 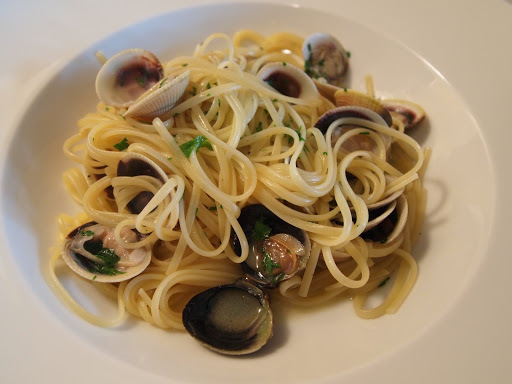 When the pasta is al dente, add some of the pasta water in the pan with the clam drippings. 7. Drain pasta and toss in clam drippings and add the clams back. Season with salt and black pepper. Finish with roughly chopped parsley.